I have joked about making this costumes for a while, before actually purchasing the first fabric. 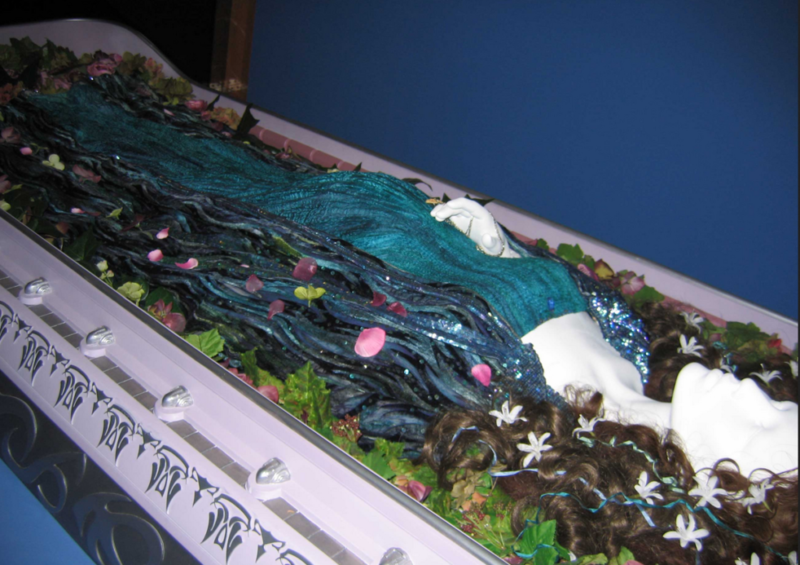 Then some years passed before I realised the materials I bought were not ideal and bought them again.The joke was about making the coffin and sleeping during parades. 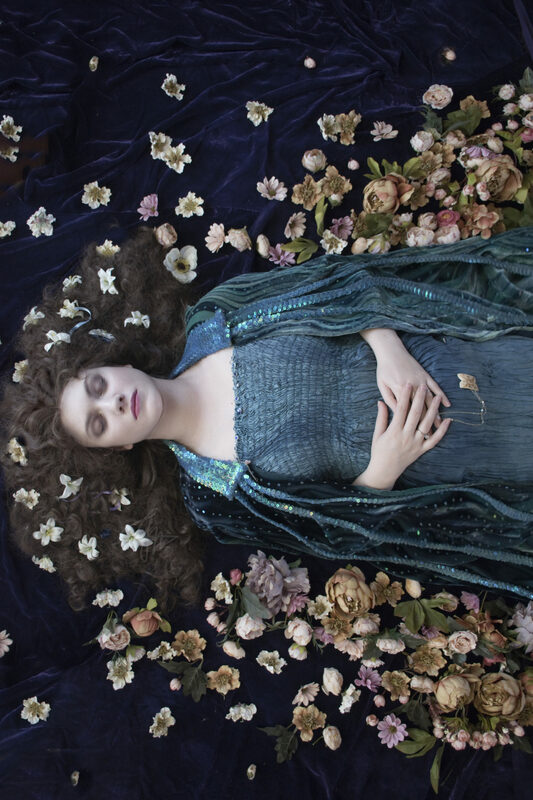 Well, without filters that coffin looks like a Barbie box, and it have been pointed out that it would be quite macabre. 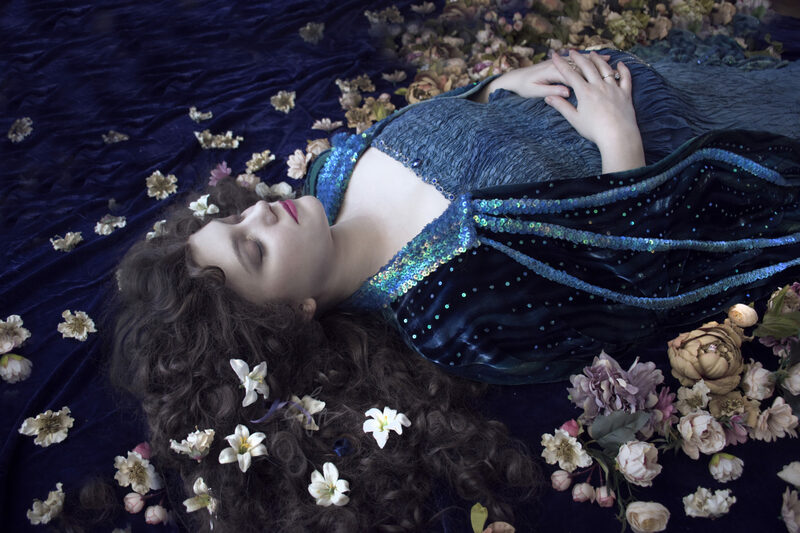 However, I am planning to make the blood handmaidens to accompany e and an other girl who has this costume. But this is again one project that will take…time. 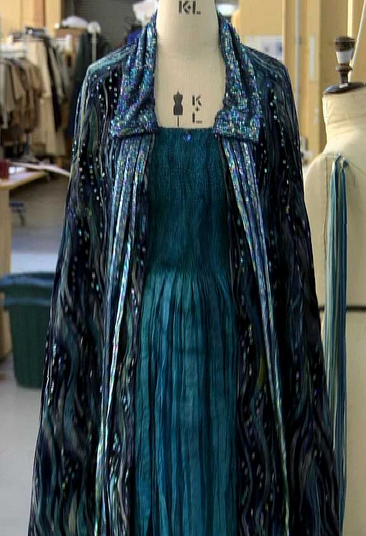 The costume is mainly made of a silk velvet cape, hand painted, and a dyed, smocked and pleated inner dress. 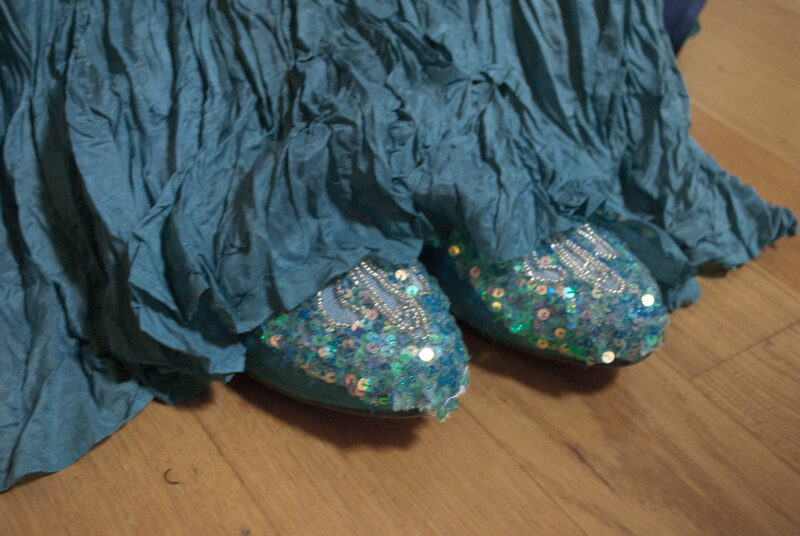 All sprinkled with more sequins one would wish for. 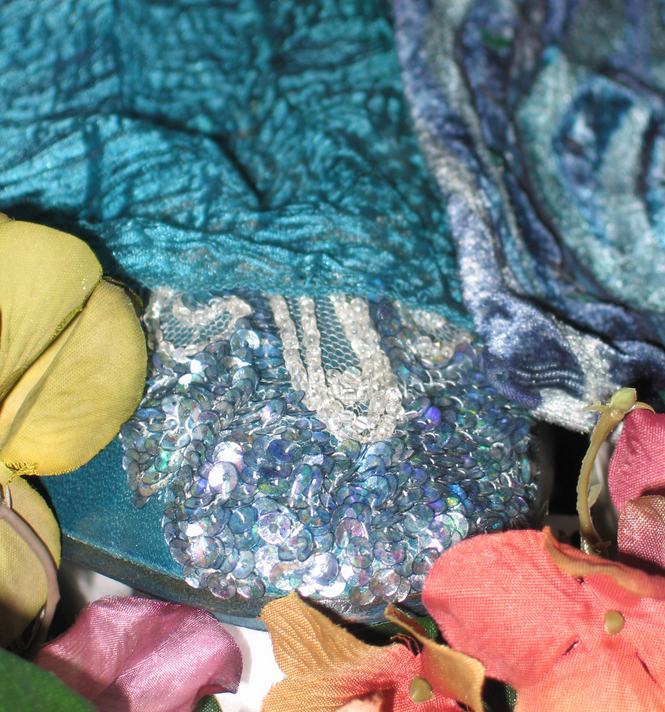 The main problem is that the original sequins were from the 1920s, made from gelatine. They are amazing, as they take the dye, but are also very fragile, as a drop of water could soften them, melt them or stain the fabric underneath. They can be made, actually they’re still made to get sequins on cake: make the gelatine, lay separate drops of it on baking paper, let them dry and pierce the center. The costume already takes a huge amount of time. Its cut is basic, but each technique will require an insane amount of time. 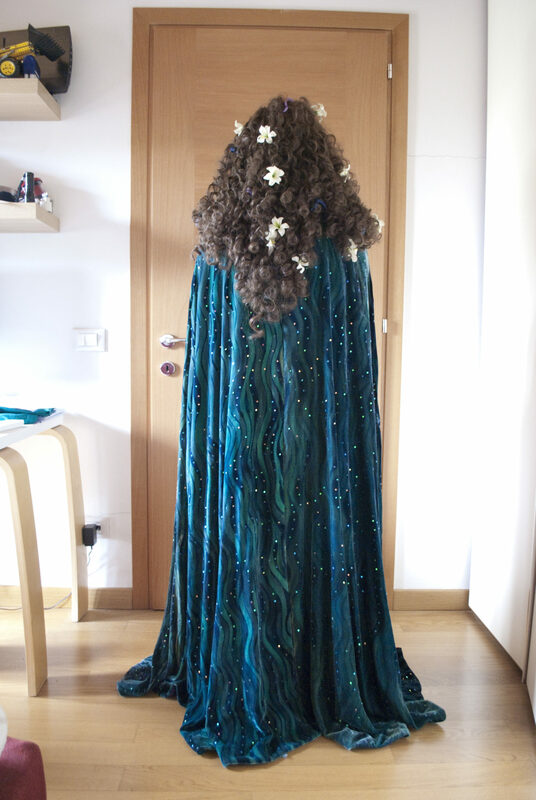 I didn’t want to spend all that time for a costume once again too fragile to be worn every time I fancy. 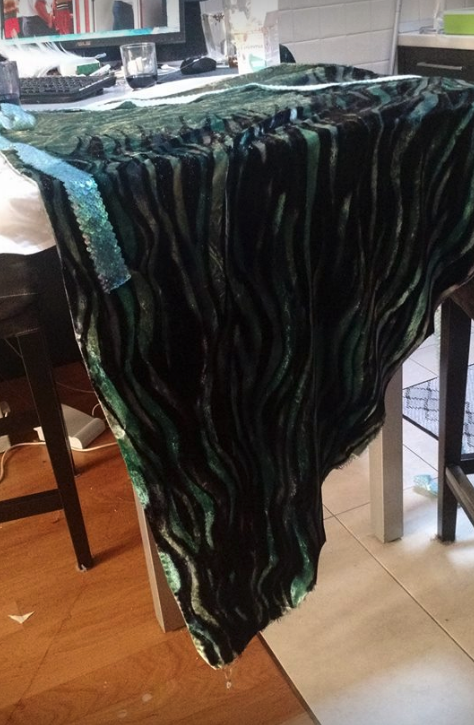 So I got lots and lots of transparent, iridescent 4mm sequins, from blue to teal, changing to green and purple. I ordered some teal silk velvet. It came a bit too dark, so I decolored and dyed it again. 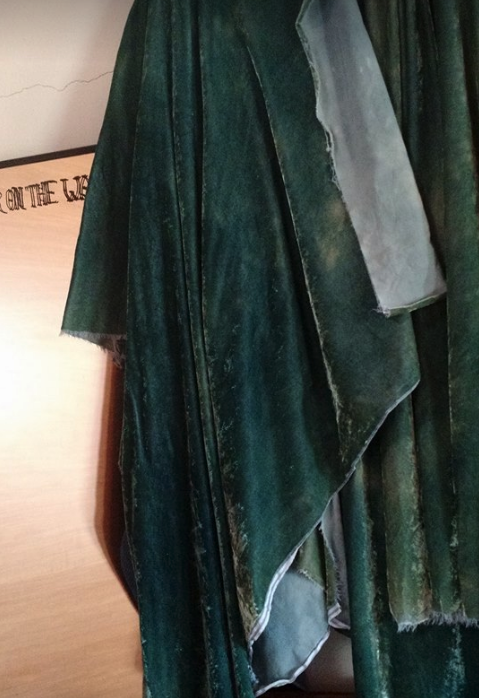 My cape is a bit dark, in pictures with flash the original looks lighter. However in some pictures when worn it looks exactly as dark as mine. Then I painted it. 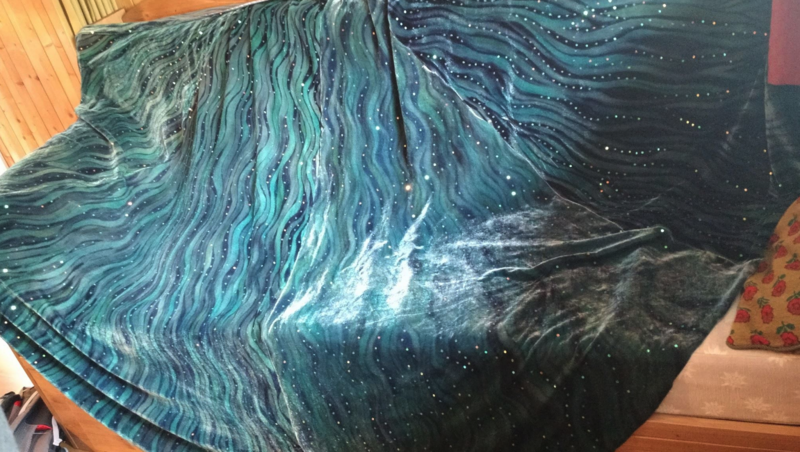 More than six meters of fabric all painted by hand. I will leave a bit of mistery on what I used and how I used it to achieve the color, just in case I decide to make others of this. I am not planning to do that soon, but who knows. Then the sequins. more than 5k just for the cape, collar not included. The problem with this dress is that it has been made to be seen only from the front. My guess is that it doesn’t have sequins at the back, but again it would be weird to look at the empty back. 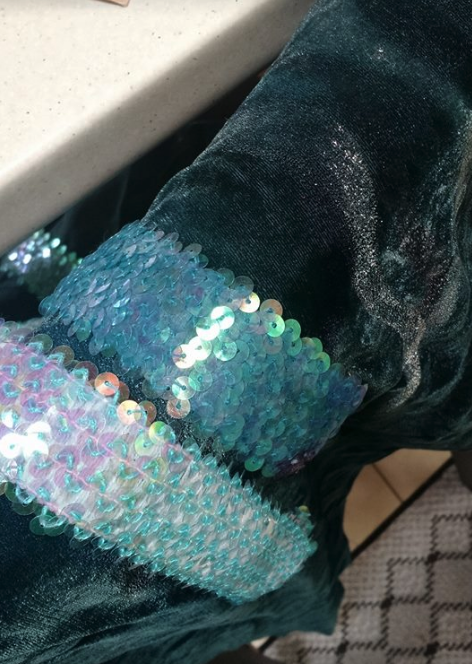 I made the collar and the front stripes of sequins from a commercial tape with iridescent transparent sequins. I painted it in a darker color from the back, to achieve a similar effect. I have folded in two the trim to make the front stripes. I also added a ribbon to the neck, to secure the cape behind the back. 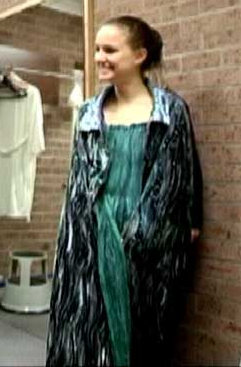 I made the inner gown from silk muslin. I dyed it by hand both before and after smocking it with my sewing machine using elastic thread between a narrow zigzag stitch. 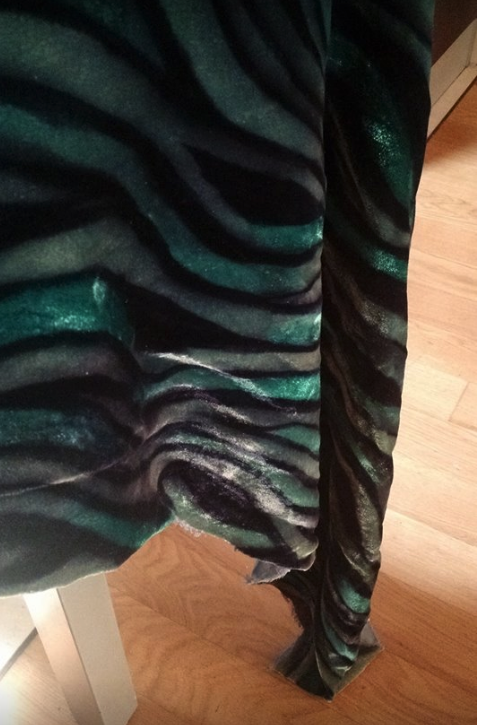 I dyed the darker stripes in black, blue e green with a brush, and tie-dyed the horizontal ones. Then I broomstick pleated it. 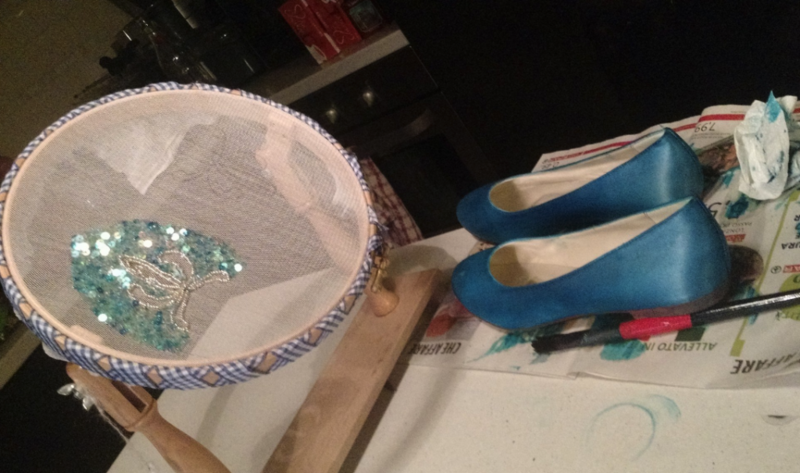 I dyed some ballet flats in teal, and I made the emrboidery on white silk tulle using the same beads in the original one (indian seed beads in transparent glass and silver core, different from the ones used for the lake gown). 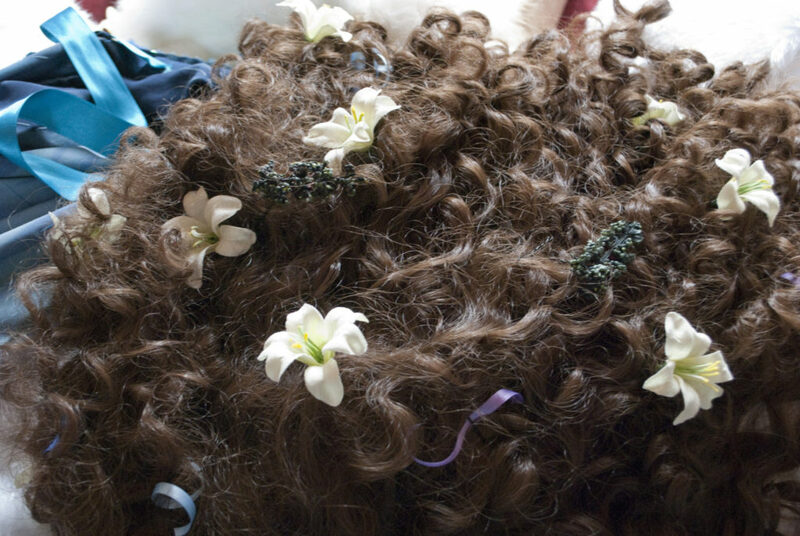 i then purchased a front lace wig, curled it, and added the lilies and ribbons (curled on a pencil with hairspray). I have cheated a bit on the green-yellow flower clusters, as they tangle in the hair once you wear the wig, and get completely hidden within a couple of minutes. They’re there, I just chose to make less than what would be correct, in order to use the wig a couple of times at least before having to re-style it. I made the fake baby belly with an elastic girdle and some soft scarves. Not very pro, but at least I don’t have a fake padded tummy to store in my already overflowing closet. Now I am looking forward to making some proper pictures!